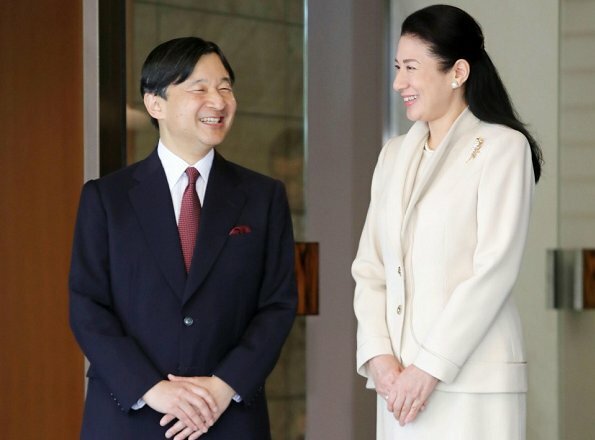 On Thursday, April 13, 2017, Crown Princess Masako sends off her husband Crown Prince Naruhito as he leaves for Malaysia, at Togu Palace in Tokyo. Crown Prince Naruhito departed for Kuala Lumpur on April 13 for a five-day visit. The Prince will deliver a special lecture at the Malaya University in Kuala Lumpur on Friday. Beige from head to toe. Would a little bit of color kill them? I know they're very traditional, it just seems so sad, having to be so bland all the time. She looks polished and put together but color seems out for this family unless they are in ceremonial wear. As Rochelle said it is good to see her out. I like Masako very much and I wish her a complete recovery. I just saw these pictures after looking at the photos of the Stephanie of Luxembourg. What an enormous difference! CP Masako looks polished and perfectly tailored for a few simple photos. HGDStephanie is representing her country in the US and is wearing ill-fitting, unflattering clothes with a plastic hair clip and plastic jewelry. For goodness sakes, I'm a stay-at-home mom from a tiny town in the middle of Wisconsin and even I dress better than that when I want to present a respectable image of myself. Im surprised the Grand duchess doesn't step in to help. She is always so polished. Agreed ! It is really sad sight. As someone said earlier today, the HGD lives in one of the richest parts of Europe and belongs to a family that is extremely wealthy, yet dresses in a way that would make most of us, without those advantages, be ashamed if we were to be seen like that. The Japanese princesses look terribly bland - if not boring - most of the time ( which may well be a style imposed on them), but their clothes are always impeccable, well-fitting, and well made. Totally agree. Very badly needs a stylist. Perhaps the high born Countess de Lannoy isn't willing to accept advice from her commoner born mother-in-law? That's just the way she comes across, stiff, cold and haughty. You'd think that Guillaume has a kind of fetish for his late grandmother, but at least Josephine Charlotte was always polished and well dressed. Beautiful lady. Very classic indeed, but how she holds herself, wow, her posture is noble, distinguished, elegant, a sweet light smile and warm, intelligent eyes. Her husband seems to love her deeply, just telling from the pictures, I must admit I did not follow her throughout the years, but something in this lady is very touching.